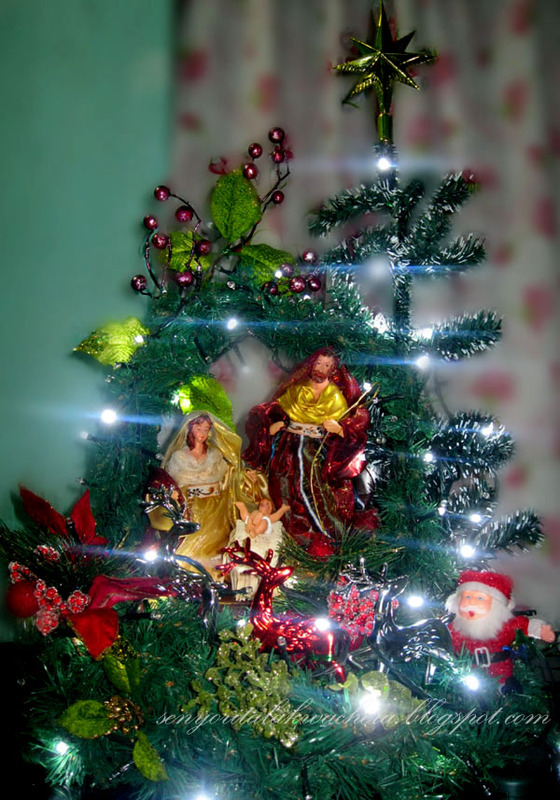 Christmas is nearly coming and like most of the children, I am excited of the decors. Way back those days that we were in the province I was very fond of creating and cropping my own decors using native materials or dried plants – I can imagine how patient I was in going in to the details of the decors. Years had passed and here I am with my busy life of a grown up girl forgetting these traditions that I had when I still got all the apple time in life. Things have changed now, instead of creating my own decors I am buying them, because I’ve got no time and because I have money to do so. One time we were at a bookstore canvasing for a better price for Christmas décor then I saw this very magnificent nativity set in a colorful and creative landscape, I also saw an old lady asking his grandson to do one for her. I run to it and checked the price and oh ha-ha the numbers is as amazing as how it looked likeJ. They are selling the Nativity set based on the cost of the materials used and the one I am looking at cost 4,700.00Php – the price seems right but me buying it? I guess not. That was the time that I felt an urge to make one. At the first look I know that I can make something like that for not more than 1500.00Php with at least 3 hours of working time. I know my grandmother would be happy to have one, like the old lady I saw in the store. So I know what I want to do, I want to go to Divisoria and buy materials that would cost me a really cheap price and that happened last Sunday. It was a hot and crowded place but the prices are very low compared to the malls around. 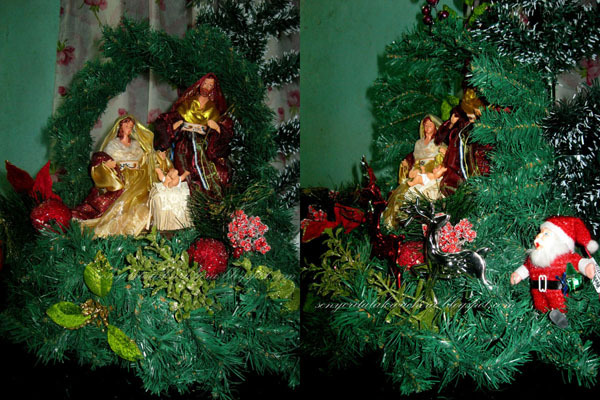 We had with us a cash worth 200 pesos lower than the cost of the nativity set and surprisingly was able to buy two 7 ft. Christmas tree, some decors and a complete material for nativity set. Just imagine how that price can be practically utilized by efforts. Back to the Nativity set, here is my personalized Nativity set. You still have time to create yours! 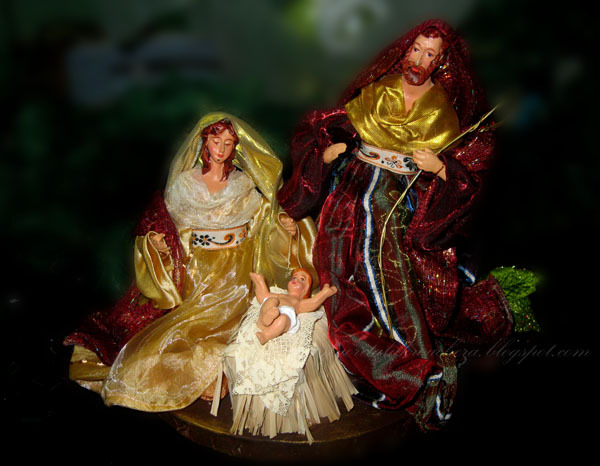 Here is how you can do your own Nativity set. Step 2: Form a house shape that is good enough to fit the Holy Family. 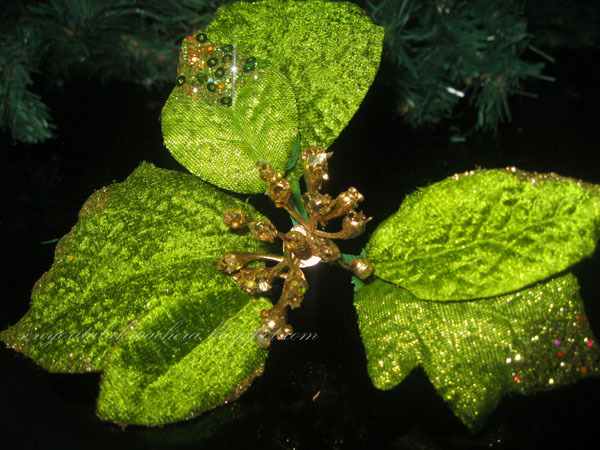 "make sure that the figures fits inside"
Step 4: Add the glittered leaves in front side of the landscape for details. Step 5: Continue adding details including the fruit picks. Step 6: Creating the Fruit three. A. Dismantle one of the flowers to be able to get a leaf. B. Connect it on the maple fruit and you’ve got your fruit tree! Step 7: connect the maple tree at the back of the house shaped grass. Step 10: Lastly put the stare on your Christmas tree. Now here is a quick look of my finish product, I already sent mine to my Lola last Monday and by today they will receive it and I will update this blog for their feedback. Once you have your own you can share it to us. Need my help? Or got some question? Feel free to leave your comment and I will respond as soon as I can. I love your Blog! Beautiful Pictures and Style! Now i follow you! Maybe we can follow each other! Hope you like my blog! cu!Greetings from Austria! Hi, saan sa divisoria mo po nabili yung garland? Thanks! Where did you bought your belen? Please answer me. Thank you.